Is anyone else (overly) excited for this year’s Oscars? I’m such a nerd about these things. The glamour, the gowns, the celebrities. Gah! Love it. I don’t know what it is about this year in particular, but I am SO looking forward to the show. I have seen a handful of the nominated movies, and I have to say, it’s anyone’s game this year. During my holiday break, I was able to see “American Hustle” and “The Wolf of Wall Street,” and both films were phenomenal…in very different ways. I just watched “Captain Phillips” last night and it was also terrific – gotta love Tommy Hanks. I have yet to see “12 Years A Slave,” “Dallas Buyers Club,” or “Philomena,” but I can’t wait to cross them off the list. The acting in the movies I’ve seen so far was fantastic, and I have no idea who will take home the awards this year, which is kinda fun. One of my favorite things to do for the awards show is to mix up a fun cocktail and a delicious meal to enjoy while we watch. 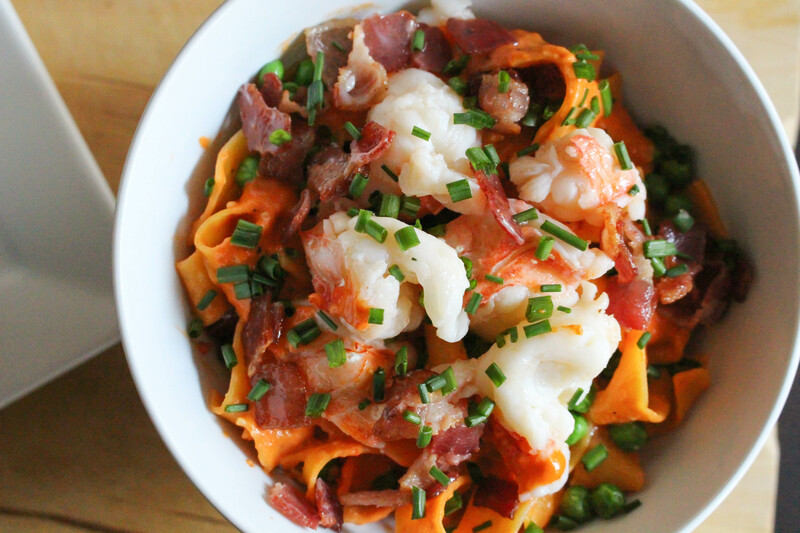 This spicy lobster noodle bowl would be absolutely perfect for that (or for a freezing snow day like we’re having today). 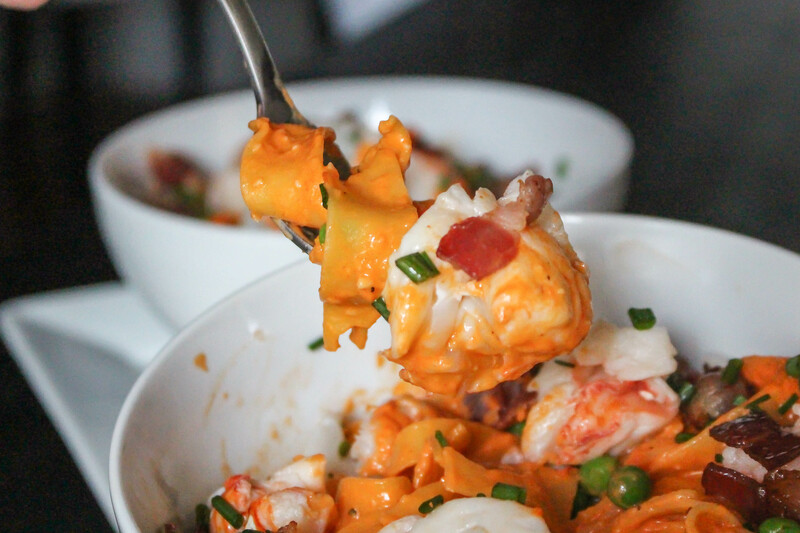 It’s hearty and full of flavor and has that “fancy-schmancy” lobster thang going on. Totally apropos for the Oscars. This dish was inspired by another meal that we ate out years ago. 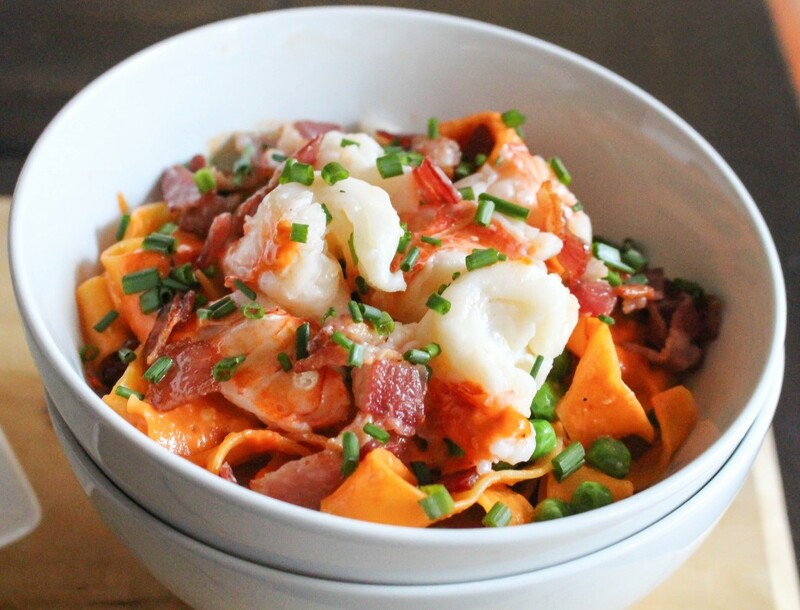 The original dish was a lobster pasta that called on several flavor notes: sweet, sour, spicy, and savory. It was so tasty. This is my attempt at recreating it. The sauce is a spicy-sweet roasted red pepper mixture that is rounded out with the saltiness of fish sauce and sweetness of agave nectar. Oh, and heavy cream and cheese. Let’s not forget those. It’s a complex combo of flavors all wrapped up in a velvety sauce. There is habanero chile in this dish, which is a BIG departure for me. I chose to go with the habanero because the original dish was served at a Latin restaurant and made with rocoto chiles (an ingredient I could not get my hands on). After much online research, I determined that the closest I could get to a rocoto was a habanero. I wanted to try to get as close to the original as possible, so I went for it. I was nervous about the heat, but it actually was quite nice. It mellowed out during the cooking process and served more as a background note than anything. I love spice in creamy pasta dishes – sometimes I think it makes the entire thing! 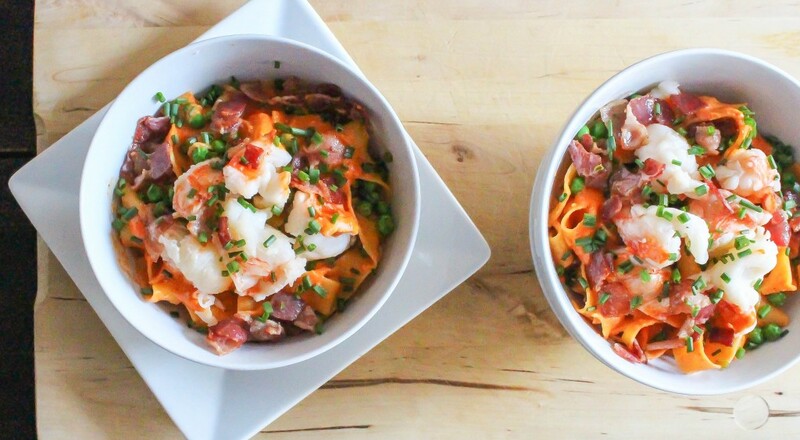 This one turned out like a spicy, more complex, red pepper carbonara. With lobster. Yum. After making and eating this dish, I realized that it is pretty versatile. If you aren’t into lobster (or its hefty price tag), this could definitely be made with shredded chicken, lump crab, or even shrimp. The flavors would definitely still work! In fact, I might try one of those renditions for our Oscars viewing party. Only six more weeks to go! Can’t wait! Bring a large pot of salted water to a boil. Fill a bowl with ice water and set aside. Cook the lobster tails in the boiling water for 5-6 minutes, or until pink and slightly curled. The meat should be opaque and white. Immediately remove from pot and submerge in ice water. Allow to sit until cool enough to handle. Remove the meat from the shells and coarsely chop. Set aside. Heat a medium saucepan and add bacon. Cook until crisp. Remove with a slotted spoon and reserve. To the bacon drippings, add the butter. When melted, add the shallots, garlic, roasted peppers, and habanero. Cook for 10-15 minutes, or until everything is very soft and fragrant. Add the fish sauce, agave, and wine and cook until the liquid is mostly evaporated. Remove the mixture from the heat and allow to cool slightly. Puree using a standard or immersion blender. Return to pot and add in the heavy cream and parmesan cheese. Stir until smooth, checking seasonings, and keep warm over very low heat until ready to serve. Cook the pasta in salted boiling water until el dente. Add to pot with the warm sauce and throw in the peas and the lobster meat. Toss until everything is well coated in the sauce and warmed through. Divide the mixture between bowls and garnish with the crispy bacon, chives, and additional grated parmesan cheese. Serve immediately. omg, i’m dying. This is perfect snow day food. I’m sitting here on my couch praying I don’t have to go into work this afternoon and dreaming of a lobster bowl. Want this so badly!